We are well into the summer with days getting longer and those inviting azure blue pools tempting us away from all those other things we really should be doing. In this newsletter we have included articles on where to find some of the best beaches and markets in the region where you can pick up a few bargains and souvenirs. The féria season is upon us and we have also included a review of the French housing market. In addition to our regular restaurant review, we will also be featuring a recipe and a wine review. There is also an interesting ‘conspiracy theory’ from Aude - the inspiration of many books and films. We hope you enjoy it. This month we are pleased to announce our new look website, designed to make it easier for you to find what you are looking for. We have added a new navigation menu on the left side that allows you to go directly to the properties for sale listed by ‘type of property’ and as well by areas. Excellent value for money! 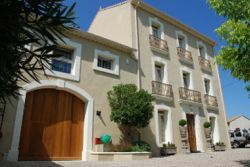 Stunning & elegant Maison de Maître that has been entirely restored to an extremely high standard, using only the best quality materials & fittings. It has 5 bedrooms, home cinema, gym, heated pool with Jacuzzi & lovely, low maintenance garden. Located on the outskirts of a pretty village near Béziers with shops & restaurants in walking distance, near to a town and beaches. In the Languedoc-Roussillon region of the South of France. It’s that time of year when thoughts turn to holidays and of eating and drinking too much while rotating slowly on a sandy beach under the beating sun. If you’ve come to the Languedoc-Roussillon looking for a beach, then you’ve come to the right place. Languedoc takes up half of France’s Mediterranean coast with four of the five Departements of the region bordering the Mediterranean Sea. There is 177km (110 miles) of coastline and 42 beaches to choose from including some of the most beautiful in the south of France. They tend to be long, wide and sandy with the low, flat plain behind. Only at Séte and Cap d’Agde do the mountains extend to the coast as cliffs. French authorities have dropped proposals to tax non-residents on their second home in France if they did not offer the property up for long-term rental. This would have affected up to 360,000 owners, half of whom were British. Fears that the new tax would have a detrimental effect on tourism caused the French government to make a U-turn. The bustling markets of the region are a great place to buy local produce, haggle for those little souvenirs you’ve just got to have, and catch up with friends for a coffee. The vibrant colours, smells and sounds are a real treat and keep the regulars coming back for more. Storeholders will try and entice you to buy their produce by letting you taste a bit of this and a bit of that and charm you with their banter. There are more than 550 regular markets to tantalise you, but here we have listed a few of the best ones – enough so that you can visit one every day for a week ! The Féria (bullfighting) season is well underway with Nîmes already with it’s first date in May under its belt and plans in train for the second round in September. Béziers is gearing up for its annual event in August (Thursday 11th to Monday 15th). René Pallincourt, president of the FNAIM, Europe's biggest business federation with 12,000 estate agents in France, says France has 'seen a surprising rebound in the French housing market'. He feels the slump is now behind us and that prices are stabilising. Currently low interest rates of borrowing are available making house purchases attractive. The problems in Muslim countries, the catastrophe in Japan and the ongoing problems in Europe are significant factors, but fortunately France’ political climate is stable and has been for many decades. Jean and Marie-Thérèse Orliac established their domaine in the late seventies, between the Pic Saint Loup and l’Hortus mountains in a beautiful and wild valley. The land, deserted since the end of WW2, needed much attention and the couple worked hard to bring it to its present glory. The reward has been worth it - now producing some of the finest wine in the region (white, rosé and red) they have a world-wide reputation.